Platinum Triangle Trilogy Diamond Engagement Ring — Form Bespoke Jewellers Ltd.
A bespoke triangle trilogy diamond engagement ring. The customer came to us for a unique twist on a classic trilogy engagement ring. 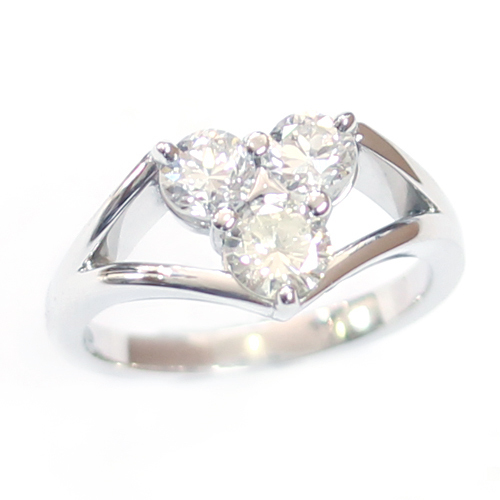 Traditionally, a trilogy ring has three stones set beside one another along the curve of the band. Sometimes coloured stones are used to flank a centre diamond or alternatively the coloured stone sits as the bold centre stone. In this instance, the customer decided on three round brilliant cut diamonds and then chose to set them in a bespoke, quirky layout- a fabulous triangle trilogy! A split shank was used to complete this unique design. The sweeping shoulders appear to hold the top two diamonds and the bottom diamond in place, and also create a bold triangle cut-out shape. 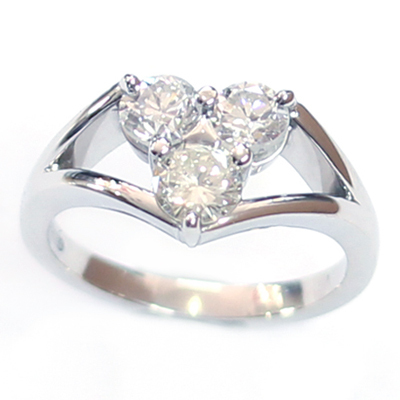 In fact, each diamond has been hand set in a three claw setting which also mirrors the triangle shaping beautifully. This engagement ring was cast in platinum. A stunning, contemporary interpretation of a traditional trilogy engagement ring.